So, as stated before one of the weak points on the F800GS (IMO) is the buttery soft suspension. I think the problem is, BMW is trying to make a shock and spring setup that is a one size fits all solution. The good news in that is, it will work OK for everyone. The bad news in that is, it will only work OK for everyone. 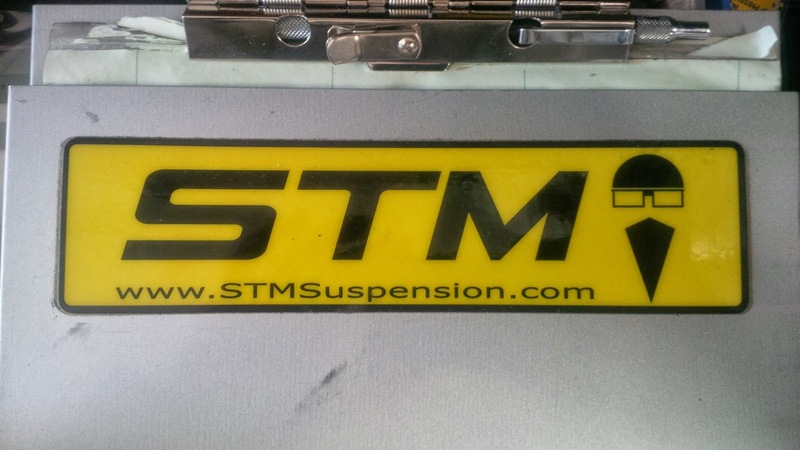 I decided to work with Dave Rose at STM Suspension. The shop is located at 216 Commerce Drive Fort Collins, CO 80524. You can reach Dave by calling the shop at 970-682-2071 or e-mailing him here. I've been working with Dave for the last two years to get the suspension dialed on my race bikes. He truly is a genius when it comes to setting up and tuning race suspension, so I figured I would work with him on this project as well. In fact, I was able to shave two seconds off my fastest lap time during a track day at High Plains Raceway the first time I spent time with him, after that I was hooked! 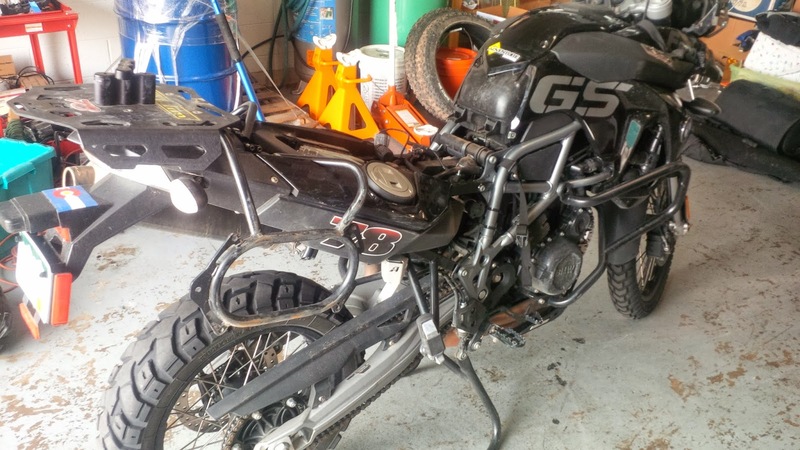 Dave has become my go-to 'suspension guy' and STM is a nice place to be able to take my bikes when parts, service, repairs, and/or support is needed. my bike. During my recent shakedown trips, the bike felt incredibly 'soft' when off paved surfaces. The front was incredibly quick to dive and would stay essentially bottomed out when riding hard. When skipping over whoop-like dirt/rock sections, the bike would cave in both front and back. Long story short, it was far too spongy, which limited 'feel' and didn't inspire confidence or aggressive riding of any sort. My first thought, maybe I'll just add some preload and adjust compression and rebound on the front end. Uhhhhhh, that was impossible as there are no adjustments available. My second thought was, maybe I'll just add heavier fork oil to see if I can stiffen it up. Well, I tried that and it didn't help much. Along the way, I played around with preload and rebound on the rear (compression not adjustable), but couldn't seem to make enough of a difference in a positive direction. So, I scrapped all of those ideas and started researching suspension upgrades and what others have done out there in ADV land. Turns out, there are several options. Touratech has several options for the rear, but as with everything they make, it was a bit pricey in my opinion (I know, I know, you get what you pay for). Hyperpro makes progressive front/rear springs at a decent price point, but I don't have a shock/spring compressor. Long story short, I called my suspension guy (Dave), and he said, "let me do a little research and I'll call you back". 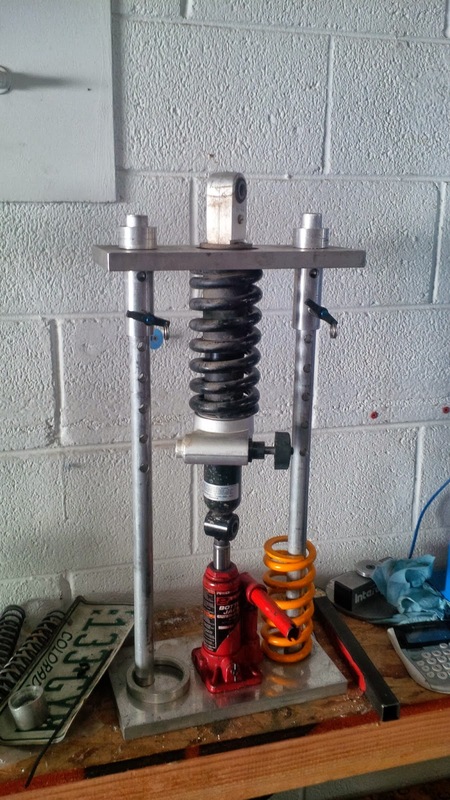 In a couple of days he had ordered both front and rear springs from Race Tech (Eibach springs). In the rear we decided to increase the spring rate from 900 lbs/inch up to 1000 lbs/inch. Dave decided against the Hyperpro setup as he didn't want a progressive spring for this application. He doesn't like the "initial movement" allowed by progressive springs because it "allows for the wheel to come back too soon". 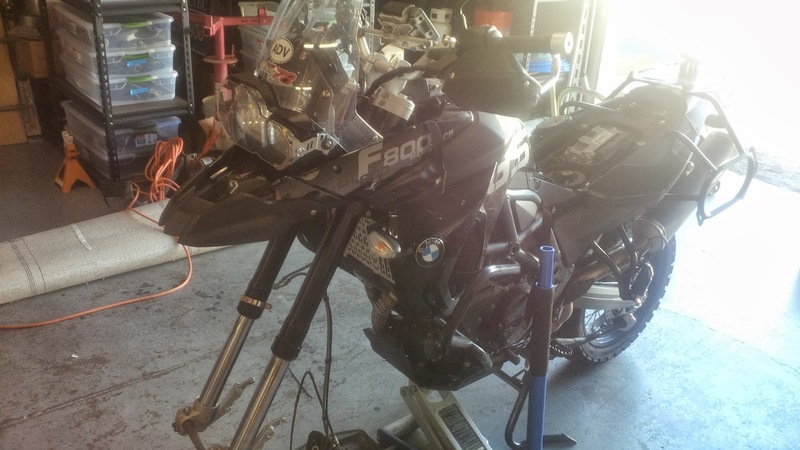 This is especially problematic when there are no compression settings on the forks, as is the case on the F800GS. In the front, we decided to increase the spring rate from stock, which was somewhere around 5.5. We put 7.5 in one, and 9.5 in the other, which leaves us with a stiffer 8.5 overall average. In addition, Dave concocted a magic fork oil blend. He was throwing around terms like centistokes (unit of measure for viscosity) alongside other mad scientist calculations, and finally came up with an Ecto-Cooler looking liquid that was around 35'ish in weight (all Silkolene product). Our fork oil blend was heavier than the recommended stock Sizzurp (aka Purple Drank) fork oil that is around 10-20'ish. All-in-all, the install took us around three hours start to finish. Overall cost came in literally a fraction of what it would have been at the dealer. Seriously, probably half the cost!!! In addition, the dealer recommends the Hyperpro kit over anything else. 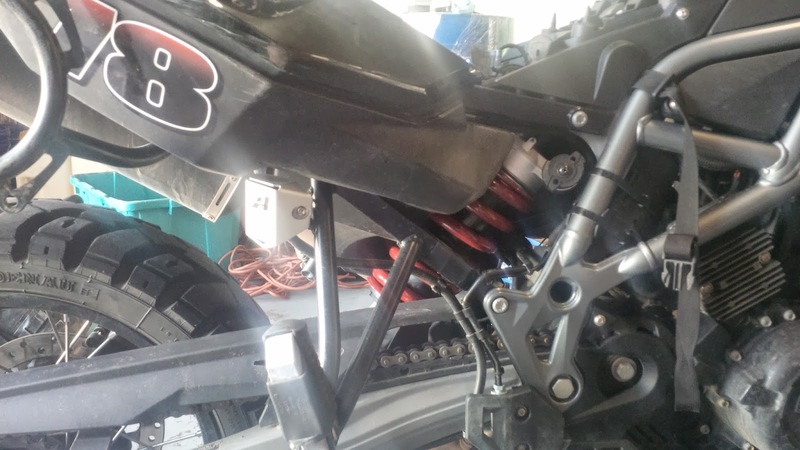 So, if you want incredible ROI, go see Dave at STM Suspension, or mail him your shock and forks. For the money, I feel it has been the best upgrade that I've done to the bike thus far.